Llana Barber, Latino City: Immigration and Urban Crisis in Lawrence, Massachusetts, 1945-2000 (University of North Carolina Press, 2017). 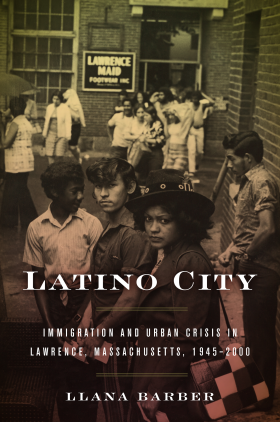 In Latino City, Llana Barber makes significant contributions to our understanding of the late 20thcentury urban crisis by examining how deindustrialization, suburban growth, urban decay, and Latin American immigration all collided in Lawrence, Massachusetts. She offers a fresh perspective on a story that we think we already know – of white flight and urban decline – by telling the story through the lens of the Latino experience, placing Puerto Ricans and Dominicans at the center of the narrative. Many Latino immigrants, in search of decent jobs, safe neighborhoods, and good schools for their children, left the crime and chaos of big cities such as New York and moved to medium-sized communities such as Lawrence. There they aspired to make a home, only to find the so-called American dream to be shattered as they confronted racism and discrimination by working class Lawrencians and middle- and upper-class suburbanites who blamed them for their city’s lack of opportunities and resources. The author makes evident her deep respect for her subjects. They were not superheroes able to overcome stereotyping and scapegoating, nor did they always act in expected ways. She pays close attention to the “multivocal” forms of protest which led to political inclusion as well as a venting of frustration against the forces stacked against them. Barber deserves praise for her ability to tease out this story from an array of sources and archives, using evidence largely ignored or neglected by previous scholars. It is a deeply researched book, and Barber effectively uses her sources to evoke the world of a struggling working class.Latino Cityis important reading for a wide range of fields – urban, Latino, immigration. It is engagingly and accessibly written, sophisticated in its argument, and thoughtful in its use of source material. Emily Callaci, "Street Textuality: Socialism, Masculinity, and Urban Belonging in Tanzania's Pulp Fiction Publishing Industry, 1975-1985,” Comparative Studies in Society and History 59:1 (January 2017): 183-210. Emily Callaci's "Street Textuality" explores the experience of late twentieth century urban migrants in Dar es Salaam, Tanzania through the pulp fiction that many recent arrivals read, wrote, and traded. Focusing especially on a painstakingly assembled trove of underground publications, Callaci explores the urban imaginaries and informal economies of young men who sought refuge in the city from the socialist experiments that overtook the Tanzanian countryside in the late 1960s. Along the way, Callaci also touches insightfully on broader themes: the global urban crisis of the 1970s and 80s, the cultural frictions created by rapid rural-to-urban migration, the tension between urbanism and third-world socialism, the role of literacy in creating and sustaining grassroots urbanity, the informal survival networks of the urban poor, and the gendered moral and cultural systems that young migrants created in globalized cityscapes bereft of industrial and bureaucratic dynamism. Callaci rightly highlights the historical relevance of relationships, networks, and reputations (phenomena that urban scholars too often downplay), and makes extraordinary use of non-traditional sources and interdisciplinary methodologies. Callaci provides a highly innovative response to dilemmas that weigh on every scholar who seeks to understand urban history beyond traditional paradigms. Her ambitious research opens new paths for historians of the urban wave that has swept across the globe in the past half century. Mike Amezcua, "Beautiful Urbanism: Gender, Landscape, and Contestation in Latino Chicago’s Age of Urban Renewal," Journal of American History 104:1 (June 2017): 97-119. Mike Amezcua's article provides an innovative treatment of the historical influence of Latina/o communities and cultural practices on recent cycles of urban renewal. In engaging prose, Amezcua provides a sophisticated delineation of the multivalent interactions among and between public and private groups at all levels of Chicago's urban society. These resulted in bottom-up processes of urban place-making and renewal that will be of interest to students of public policy and governance in a wide variety of contexts. The piece contributes usefully to an existing body of scholarship that urges us to see midcentury, federally-funded urban renewal efforts across the United States in more nuanced ways, and it does so by foregrounding the everyday negotiations, practices, pressures, and adaptations that renewal policies and worldviews elicited at the block and neighborhood level. Leif Fredrickson, The Age of Lead: Metropolitan Change, Environmental Health, and Inner City Underdevelopment in Baltimore, Ph.D. Dissertation, History, University of Virginia, 2017. Using Baltimore as a case study, Leif Fredrickson’s “Age of Lead” exposes the role of lead-related technologies in spurring metropolitan development and suburbanization and inequalities across the twentieth century. Fredrickson persuasively argues that lead-technologies shaped and connected economic and political structures, patterns of racial and spatial inequality and the lives of individual residents of Baltimore across the 20th century. He shows the ways lead helped drive metropolitan development, and that metropolitan development affected the size and distribution of lead hazards as suburbanites and suburban development benefited from lead-related technologies, such as lead piping, lead-acid batteries and leaded gasoline. At the same time, the harms of these very same technologies were born disproportionately by residents of the inner city and compounded deepened health and economic differences and deepened racial and spatial divides. This original and imaginatively-conceptualized dissertation draws on extensive archival research ranging from municipal records to medical records and offers new understanding of the social production of knowledge about lead, health and the environment more broadly. Age of Lead exposes how lead-technologies offers a new and powerful window for understanding metropolitan inequality and illuminates the many material consequences of environmental inequality, not just the causes. Fredrickson ultimately provides path-breaking insights into the relationship between metropolitan development, environmental health and social inequality. Nora Krinitsky, The Politics of Crime Control: Race, Policing, and Reform in Twentieth-Century Chicago, Ph.D. Dissertation, History, University of Michigan, 2017. Through a case study of policing and reform in Chicago in the interwar period, Nora Krinitsky’s dissertation reveals the integral role of crime control in the governance of modern American cities. It complicates prevailing understandings of mass incarceration and the relationship between crime and race in urban America in the twentieth century. Krinitsky demonstrates the how in the interwar period crime control served as the primary political proxy through which city leaders, reformers, and law enforcement officers sought to achieve urban order, and in doing so contributed to the constructed modern social and racial hierarchies as well as new forms of state power. Offering close and nuanced readings of legal records and other materials Krinitsky shows how central the police became to urban governance and how the power of discretion became a central means for the creation of racial formation and racial hierarchies. This very-well crafted, well-researched project makes important interventions into and connects on scholarship on the carceral state, urban history and state power in the twentieth century.